Kellyanne Conway Blames the Murder of Jews On Me, My Colleagues and, of course, the Jews — Joe Raiola! 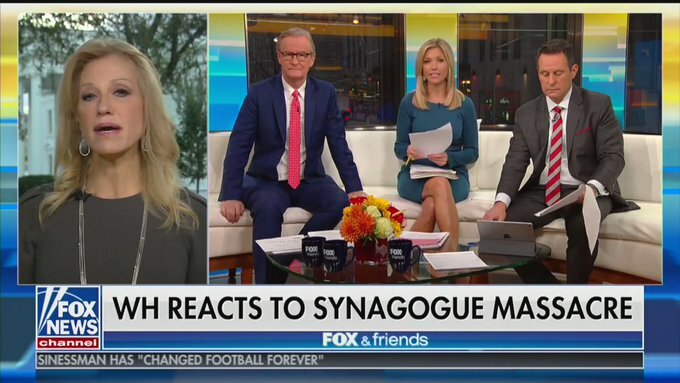 The Queen of Alternative Facts blames comedians for the mass shooting of Jews and the hosts of Fox and Friends agree. No, I did not storm into the Tree of Life synagogue in Pittsburgh and start gunning down Jews, but as one who has spent his entire professional life as a satirist, I am largely responsible for the horror that unfolded, and not just me. All comedians, especially those traitorous late night talk show hosts, are responsible for the unspeakably bloody act of anti-Semitism that left 11 dead. It is time that that we humorists took a good look in the mirror and committed to toning down our wisecracks before another Jew is senselessly slaughtered. Yes, it has come to this. Kellyanne Conway, who has been shamelessly whoring for Donald Trump since she dumped Ted Cruz in 2016, has conjured up a doozy of a new alternative fact: Comedy killed the Jews. And we all know who is mostly responsible for comedy: Atheist liberal Jews who hate God and want to take away your guns. In other words, Bill Maher, even though you’re not a Jew, this is mostly on you, however the atheist liberal Jews who run HBO and give you a platform to spew your comedic hate are accomplices. Obviously, it is the atheist liberal Jews who have driven God out of the public square and we all know that leads to terrorism. A lot of people are saying that, a lot of people. This is the logic of a moron at the top of his game, though with all due respect to Huckabee, it was his sanctimonious mentors Jerry Fallwell and Pat Roberston who created the template that Conway is using now. In their infamous rundown of those who were to blame for the 9-11 terrorist attacks, it was the pagans who came first, even before the despicably evil abortionists, feminists, gays and lesbians. Somehow, comedians were left off the list, but adding them to it now seems like a natural extension. Actually, it was that Jew comedian Jon Stewart who flew the first plane into the World Trade Center and somehow managed to parachute out just before impact. Feel free to use it Kelly, it’s another alternative fact. Kellyanne Conway is an Orwellian. Like Trump, she has no discernible interest in reality and any truth she speaks is incidental. She is a free-agent mouth piece for whichever Republican can pay her the most, though she seems to have found her true calling in being the staunch and vulgar defender of a lying sociopathic fascist. While Trump is not responsible for the synagogue shooting, he consistently foments violence with his rhetoric. After all, there are some “good” Jew-haters out there, right? That’s what Trump told us in the aftermath of the ugly “Unite the Right” rally in Charlottesville. And let’s not forget Trump’s arch enemy, namely the “fake news media.” Who runs that? And let’s also not forget that Jew, George Soros. Before an insane Trump supporter sent Soros a pipe bomb, Republican Congressman Matt Gates accused him of paying women and children to storm the US border, a lie that Trump, of course, did nothing to disavow. Since we’re on the subject of blaming Jews, let’s not forget MAD Magazine, where I was an editor for over three decades. It was started by William Gaines and Harvey Kurtzman, both Jews. When Kurtzman left in 1956, another Jew, Al Feldstein, took over and hired Jew artists and Jew writers. Think of all of the damage to our culture those Jews did, satirizing politics and revolutionizing American satire. In the twisted worldview of Kelly Anne Conway and Donald Trump, even when Jews are murdered in cold blood, it’s the Jews fault. They won’t come out and say it, but their meaning is clear: the Jews, especially those comedy Godless Jews, of which I consider myself one, did this to themselves. The Jews will not be safe until they stop making comedy.